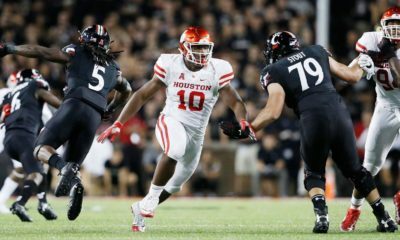 Who were the biggest winners and losers in 2019 NFL Draft Prospects after the first day of on-field workouts. The offensive lineman, specialists, and running backs worked out today in front of NFL teams. 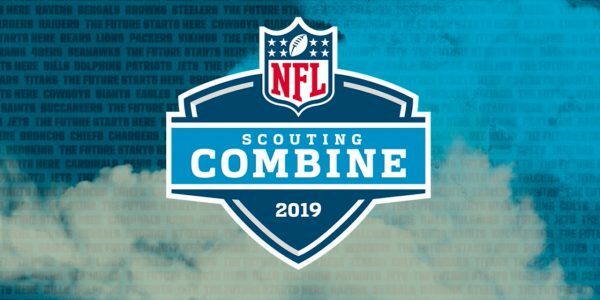 The first day of the Combine is always fun, and while some players struggled some really shined. Let’s talk about five players who really dominated today after the first workout day. Garrett Bradbury, OL, NC State – Bradbury ran a 4.92 forty, his get off was phenomenal and he looked really fluid in his drills. Today Bradbury made a ton of money. He may be the best center in the entire 2019 NFL Draft, and he looked the part today. He finished with 34 bench reps of 225 pounds, a 31 inch vertical, and a 7.41 three-cone drill. Justice Hill, RB, Oklahoma State – This kid killed it today. He ran a 4.40 forty and had a 40 inch vertical. He had a good day catching the passes and looked like one of the best players in Indianapolis. Hill had 21 reps of 225 pounds and 130 inches in his broad jump. His stock is flying upward. Alex Barnes, RB, Kansas State – Barnes ran a 4.59 forty yard dash, had 34 reps of 225 pounds on the bench press, a 38.5 inch vertical, and a 6.95 three-cone drill. Barnes had a huge day and impressed everyone. He was a true workout warrior and he looked great doing drills. Andre Dillard, OT, Washington State – The 6050, 315-pound offensive tackle may have solidified himself as the first offensive lineman taken in the draft. He had 33 1/2 inch arms, ran a 4.96 forty yard dash, repped 225 pounds 24 times, and had a 29 inch vertical. This kids stock is flying right now and rightfully so. Erik McCoy, OL, Texas A&M – A 4.89 forty? Yes, McCoy at 6040 and 303 pounds ran a sub 4.9 forty. He threw up 29 reps at 225 pounds and finished with a 31 inch vertical. He was so fluid in his drills and looked like the best offensive lineman. Elijah Holyfield, RB, Georgia – Holyfield is a big boy, but the kid ran a 4.78 forty yard dash. He did have 26 reps of 225 pounds, but he struggled to catch the ball out the backfield as well. With the past success of Georgia running backs, I would still give him a shot, but his stock is not trending upward after today. Greg Little, OT, Ole Miss – Greg Little ran a 5.33 forty yard dash and had a horrible 25 inch vertical. 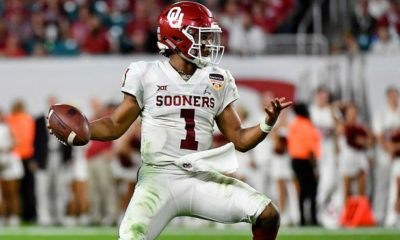 I thought he would shine because many had him as a top 15 draft pick, but after today I think he will fall a little farther. He could end up being a second round pick. David Montgomery, RB, Iowa State/Benny Snell, RB, Kentucky/Devin Singletary, RB, FAU – These guys were not bad in the drills, but their forty times were not great. All three ran a 4.63 or worse. These three players were talked about by many going into the draft, some were mentioned in the first/second round talk, but I am not sure any of them will be taken before round 3. Singeltary had a decent vertical, but Montgomery and Snell were under 29.5 inches. David Edwards, OL, Wisconsin – Darn near all the Wisconsin offensive lineman were at the Combine, but Edwards looked the most lost. He is a huge kid, and his film is terrific, but he really looked like he struggled in the drills. He did not test that amazing either, Hitting a 25.5 inch vert, a 99 inch broad jump, and a 5.28 forty yard dash.